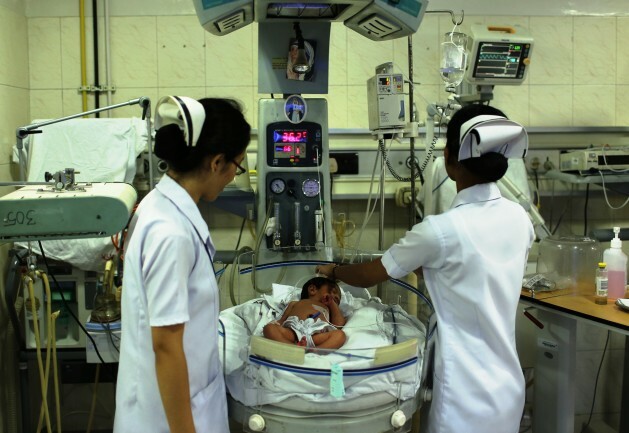 An infant in intensive care at the Holy Family Hospital in New Delhi. Indian hospitals prefer traditional DPT vaccines. Credit: Holy Family Hospital. NEW DELHI, Feb 8 2014 (IPS) - A spate of sudden infant deaths following vaccination in India has prompted leading paediatricians to call for stronger regulatory mechanisms to evaluate new vaccines for safety and efficacy before their acceptance into the national immunisation programme. According to data obtained from the Union Ministry of Health and Family Welfare, over the last one year 54 babies are recorded to have died soon after receiving the newly introduced “pentavalent” vaccine that is designed to prevent infection by five disease-causing microbes. Rolled out gradually in different Indian states since December 2012, the pentavalent vaccine is a combination which seeks to confer immunity against Haemophilius influenzae type B and Hepatitis B, in addition to the protection afforded by the traditional trivalent vaccine against Diphtheria, Pertussis and Tetanus (DPT). “Going by the ministry’s figures, an average of one death has occurred for every 4,000 babies vaccinated with pentavalents,” says Dr. Jacob Puliyel, who heads paediatrics at the St. Stephen’s Hospital here. “If the birth cohort in India of 25 million is vaccinated with pentavalents, 6,250 babies will die each year from adverse effects following immunisation (AEFI). “The huge cost in terms of lives lost from AEFI on being given the combined pentavalent vaccine is difficult to justify,” Puliyel tells IPS, adding that the time-honoured DPT vaccine had a far better record for safety. Given that the reporting of AEFI in many Indian states is unreliable, paediatricians believe that many more deaths may have occurred than recorded, and recommend a ban on the use of pentavalent vaccines until there is a thorough investigation of the policy change that allowed their entry into India. In September 2013 Dr. Yogesh Jain, former assistant professor of paediatrics at the All India Institute of Medical Sciences and currently expert at India’s Planning Commission on developing universal health, filed a public interest litigation in the Supreme Court seeking a ban on pentavalent vaccines. Jain’s lawyers argued at preliminary hearings that the “five-in-one” vaccine is banned in Canada, the United States, Europe, Australia, the United Kingdom, and Japan as also in the developing countries Pakistan, Bhutan, Sri Lanka, and Vietnam, following infant deaths. In most countries vaccines are introduced into the national programme after an expert committee has studied the burden of the disease, the safety and efficacy of the vaccine and affordability. If these are satisfactory the vaccine may be considered for inclusion in the routine immunisation schedule. Typically, according to Puliyel, once a vaccine gains entry into the Universal Immunisation Programme (UIP), funding is withdrawn and the government finds itself saddled with the full costs of supporting a vaccine of doubtful value and, in some cases, dangerous. In India, until recently, when a vaccine was proposed to be introduced into the UIP, a subcommittee of the NTAGI would review the available literature and consult experts to make an informed decision. In the interests of transparency the minutes of the meetings and recommendations would be uploaded onto the ministry’s website. In 2013, an Immunisation Technical Support Unit funded by the Bill & Melinda Gates Foundation was set up to “help” NTAGI in its work, but a new confidentiality clause was inserted to protect the “proprietary” interests of commercial, academic and research institutions. “In fact, the confidentiality clause is not limited to proprietary matters and NTAGI members are barred from divulging discussions, opinions or decisions for 10 years after leaving the committee that decides on the new vaccine,” Puliyel says. “Vaccines being introduced in the UIP must be cost effective and look at the disease pattern and load in the country, rather than ape models from other countries,” says Sumbul Warsi, leading city paediatrician and medical director of the well-known Holy Family Hospital. Puliyel says the government must publish information about a vaccine under consideration for inclusion in vaccination schedules. Stakeholders, including patient groups, health professionals, academic institutions, vaccine companies and organisations like the WHO and GAVI can then register their interest. Transparent processes would gain the confidence of the public, which is vital in any mass immunisation programme, Puliyel says. There could be other side effects other than death which we will soon know. Also this vaccine is nothing new it combines the existing vaccines . The only advantage is one prick is reduced, but to beta test this thousands of babies have to die. I would expect the vaccine to have been through clinical trials before approval. Has causal connection between deaths and vaccine been established? It does sound like this process should be reformed. More transparency in decision making would be good. Clinical trials are created and funded by pharma and by no means equate safety, especially when they get to cherry pick the trial they wish to present, financially influence fast tracking to market and then are immune from liability for harm to boot. Medical politics and pharmaceutical lobbying have more to do with vaccine approval than actual scientific evidence of safety. Profits come first. Do you have any evidence of that claim? The process of approval in most countries involves multiple layers, government actors and scientists. I hope these vaccines does not make these children sterile…..after all Bill Gates is a big fan of depopulation ?? The protocol of clinical trials is drawn up by the pharmaceutical industry. This enables them to carry out the tests in such a way that produces good results for them. There is widespread manipulation of clinical trials. Negative results are not published, positive results are repeatedly published in slightly different forms. There is minimal auditing by authorities. If a protocol is discontinued the results don’t have to be passed on to the regulatory authorities. But why are these test series stopped? Because there are difficulties. One “difficulty” may be because patients die. Dr David Graham (senior drug safety researcher at the FDA), stated that the FDA works for the pharmaceutical companies, not the US tax payers. The burden of proof of safety and efficacy is on the pharmaceutical companies. If they can show their drugs are more effective than a sugar pill, they are approved. Unless it is beyond obvious a drug is dangerous, the population is the final testing grounds. Only after so many deaths or high risk side effects will a drug be withdrawn. You can find his Congressional Testimony online. He’s a whistleblower still working at the FDA. The FDA works for the U.S. government. Yes, the burden of proof – of safety and effectiveness – is on the companies. But for vaccines, especially, there is a pretty high burden of safety. To remind you, the first Rotavirus vaccine was withdrawn for a very rare side effect. And by the way, this article is about a non-U.S. situation. Do you have any evidence that vaccine clinical trials are manipulated? The Rotavirus vaccine was already in widespread use on the PUBLIC when it was finally withdrawn. The are NO good scientific (double-blind) studies on any vaccines. Sign that consent at your own risk. And the article is wrong, we do use the 5 in 1 vaccine in the US, plus 2 more: DTP, Hib, Hep B, IPV and pneumococcal. The article is focusing on events in India. What’s wrong about that? The problem with the rotavirus vaccine was so rare – less than one in ten thousand – that it was not discovered in the clinical trial, that’s true. It was discovered shortly after the vaccine came to market and action taken immediately. That comment was a response to the claim that “only after so many deaths or high risk side effects will a drug be withdrawn” – that was not the case. the number of cases was small but it still led to the vaccine being withdrawn. There are excellent, extensive scientific studies on vaccines – and clinical trials are double blind. Not vaccinating leaves children at risk of dangerous diseases. Nothing is 100% safe, but vaccine risks are, generally, very, very small. Please send me a link to the double blind studies. I would love to read them. “Infant mortality rate India’s enduring shame,” reads a headline in the Declan Herald, in a story on your country’s death rate among children from preventable causes. The infant mortality rate in India is 72 children per 1,000 live births–that is worse than in Bangladesh, one of the poorest countries in the world. With all of your truly wonderful advances in education, your country’s media outlets are failing to hire science writers who can write about science intelligently so that people and politicians can make informed decisions about the introduction of new vaccines. And India is 171st in the world in its spending on public health, so when your nation is paying so little to save lives, it is difficult to take seriously any talk of concerns about the cost of a vaccine. I have two grown children–both fully immunized. Vaccines led me to trust that my children would grow to adulthood and that I could safely have just two. I was right. And I am grateful to the technologies that have allowed my family to give our children the educational advantages possible with a small family. All of India could do the same, if you stopped listening to the scaremongers, including the journalist who wrote this story. Your studies that you listed are a perfect example of useless trials. They tested the primary vaccine group against another vaccine group! How can you see the safety outcome when you are vaccinating both groups at the same time with different vaccines and then comparing the two for adverse reactions? They will both have just as many bad reactions, and because they both had relatively the same number of bad reactions, they then classify the vaccine as ‘safe’.. ridiculous! I think what misled you was that the first link talked about a “control vaccine”. But in none of these cases were the vaccines compared to another vaccines – they were all compared to a placebo. If you read the other links, you will see that. As to administering the rest of the childhood schedule – participating in a clinical trial for one vaccine is really not a good reason to leave a child unvaccinated against the rest of the diseases. And in fact, this allows to test the safety of the vaccine with the rest of the schedule. This the product of PhD research, which to my mind is scientific. I have challenged Australian authorities to refute this information, but they are silent. I am also campaigning to have Australia to establish an independent research facility to vet all substances ingested by people, there being no such independent work done in the US, NZ or Australia. The response has been silence. The same silent authorities claim the cause(s) of autism is unknown and that no cure has been identified… two outright lies. I have watched videos of Dr Natasha Campbell-McBride’s clinic patients and read her diagnosis, along with those of other experts. Autism is increased from 1:10,000 fifty years ago, to 1:50 today, with no recognition by the medical fraternity that this has reached catastrophic proportions. My interpretation is that, cumulatively, the medical-pharmaceutical industry fears any admission of harm contributed by vaccinations, adjuvents thereof, and misuse of antibiotics will lead to litigation that will destroy them both. No, studies conducted on animals have shown that combination vaccines do more harm than if the component vaccines were administered individually.